87 Bristol Street, Suite 2b, Cambridge 02139. 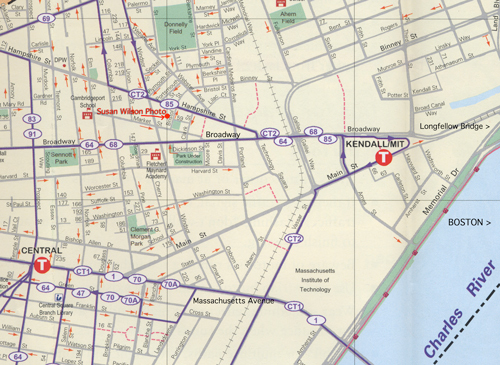 AREA LANDMARKS: We are in the Kendall Square area, in the heart of "GeneTown," not far from the Kendall Cinemas, Lord Hobo (formerly the B-Side), the Blue Room, and Atasca restaurant. Our segment of Bristol Street is a small one-way passage between Broadway and Hampshire streets, accessible only via Windsor because of other one-way streets. OUR PARKING LOT: People often over-shoot our lot. Once you turn left on Bristol, there will be a tot lot on your right, and a large gray building on the left corner. The next large, 12-car, gravel parking lot on your left -- with 87 on the left and right fence posts -- is us, 87 Bristol. Our three-story gray building is at the back right hand side of the lot, and actually behind the red house marked number 85. If you get as far as Hampshire, back up a half a block and come on into our free lot! T STOPS: We are a 10-15 minute walk from the Kendall or Central Square Red Line T stops. The 68 bus, which runs from Harvard Square to Kendall Square, stops one block away. WALKING FROM THE KENDALL/M.I.T. RED LINE T STOP: Depending on your pace and the weather, it's about a 10-15 minute walk from the T stop to the studio. When you emerge from the T you're on Main Street, Cambridge, lined with flags down the middle. Make sure the tower clock, the Charles River, and Boston are to your back. Walk to the corner of Ames, passing the MIT Coop and the big fish sculpture of Legal Seafoods on your right. Take a right onto Ames, follow Ames to the next corner (Starbucks and Quantum Books), then take a left onto Broadway. Continue on Broadway, crossing over Galileo, past a huge billboard on the right, then crossing the railroad tracks and a couple of stoplights. After you pass Portland Street and the Garment District store, you'll see a Dunkin Donuts on the left, and Karli's Gas on an island in the middle of the Y in the road. Bear right at the Y at Karli's onto Market Street. Walk down one more block, taking a right onto Bristol Street, passing around the Market Street Park (tot lot) at the corner. Once on Bristol, we are No. 87, facing the park -- a large gravel parking lot. Walk to the back of the lot, then take a right to our building. FROM THE SOUTH: North on 93. Take Exit 26 to Storrow Drive. Once on Storrow, take immediate left ramp exit toward Government Center/Cambridge. Follow exit ramp to Charles Circle (Charles T stop), then take a right over the Charles River via the Longfellow (salt and pepper shaker) Bridge. You are on Broadway; go straight, six lights. The sixth light is Windsor Street. Right on Windsor, first right onto Market, first left onto Bristol. Take left into large gravel parking lot with fence marked number 87. You are here. Park. FROM THE WEST: Mass Pike east to Cambridge/Allston exit. After descending exit ramp and passing through two stoplights, go straight across Charles River via River Street Bridge. Continue straight on River Street through Central Square, crossing Mass Ave, then continuing straight down Prospect Street to intersection with Broadway. Right on Broadway, past Columbia Street. At stoplight at Windsor Street, take a left on Windsor, first right onto Market, first left onto Bristol. Take left into large gravel parking lot with fence marked number 87. You are here. Park. FROM HARVARD SQUARE: Take Broadway from Harvard Square toward Kendall Square and Boston. Pass major intersections/stoplights at Prospect and Columbia. At stoplight at Windsor Street, take a left on Windsor, first right onto Market, first left onto Bristol. Take left into large gravel parking lot with fence marked number 87. You are here. Park. FROM PORTER SQUARE: Take Somerville Avenue through Union Square. Go straight across Union to Webster Street, which becomes Columbia after you cross Cambridge Street. Once on Columbia, take a left at the light at Hampshire, right at light on Windsor. First left onto Market, first left onto Bristol. Take left into large gravel parking lot with fence marked number 87. You are here. Park.